Soccer is one of the sports that is very physically demanding, and can be very dangerous at times when head concussion may be involved. 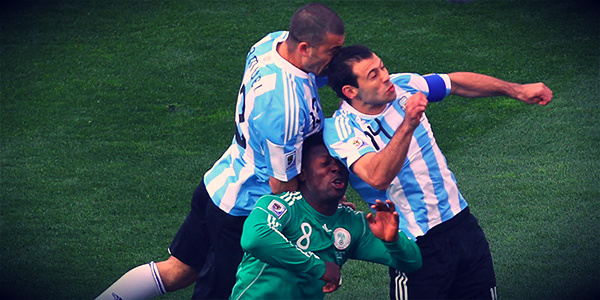 In most cases, soccer concussion occurs when the soccer ball is in the air, and two or more players go up to head the ball, but instead a clash of heads occur, causing possible head concussion. This article will give better understanding of concussion head injuries, with information and the signs pointing towards a possible head concussion. Head injury occurs most often in sports and car accidents. What is a Concussion Head Injury? Head Concussion is a traumatic head injury that occurs from mild or severe blow to the head. Some of the head injuries appear to be mild when they first happen, but research has shown that concussion can have serious long term effects, especially in case of repeated and untreated head injuries. Concussions are mainly caused by head trauma, where a blow to the head causes the brain to move violently within the skull, causing all the brain cells to fire at once, much like a seizure. The word concussion comes from Latin word "concutere", meaning "to shake violently". Passing out, or loosing conciseness, is the most serious symptom for head concussion. Head concussion can also occur where the athlete may not even realize it until later on, when the body cools down and the symptoms start to show. It is not easy to know if someone has a concussion, but the symptoms listed below indicate that a person has most likely suffered a head concussion injury. Head concussion injuries range from mild to severe, and can last for hours, days or even months depending on the severity of head injury. If there is even a slightest chance that a concussion has occurred, seeing a doctor is the best option. Injury to the head is very serious, because head/brain is the most important organ in our body and should be treated by a professional for complete injury extent and recovery. NOT BEING ABLE TO THINK CLEARLY. LACK OF ABILITY TO REMEMBER NEW INFORMATION. Thinking and remembering things after a possible concussion is noticeable in athletes, as they seem confused with all that is going on around them during a high tempo soccer game or training. Physical symptoms of concussion will clearly indicate that something is wrong, and that a head injury may have occurred. Any of the following concussion symptoms may show after a blow to the head occurs. HEADACHE is the first symptom. Headache will feel like the whole skull is under pressure. BLURRY VISION comes from inability for eyes to communicate fully with the brain. This causes fuzzy or blurry vision. NAUSEA & VOMITING is a symptom of concussion that can be easily recognized in athletes. DIZZINESS causes athletes to lose their balance when a blow to the head is suffered. SENSITIVITY TO LIGHT AND NOISE causes our senses to become heightened. This follows with discomfort in eyes from the light, and ears from noise that is not necessarily loud. BALANCE concussion symptom will cause athlete to feel disoriented, and have a hard time staying on their feet. FEELING TIRED OR WITHOUT ENERGY causes athlete to feel sleepy and tired throughout the day, after head injury occurs. These are most common physical symptoms of concussion, and can be easily recognized after a blow to the head occurs. Experiencing any of the above mentioned symptoms should lead to a doctors visit, where necessary tests will be performed to decide the severity of head injury. Emotional and Mood Concussion Symptoms are hardest to spot by the athlete themselves, but this symptom is very easily spotted by family or friends close to the athlete. EASILY UPSET OR ANGRY recognized by friends and family, because of change in athletes personality. FEELING SAD like everything around the athlete seems to be falling apart, causing sadness. NERVOUS OR ANXIOUS is a symptom of concussion where the athlete shows no patience for doing things, or feels nervous about simple things in everyday life. Emotional and mood symptoms of a concussion should be recognized by people closest to the athlete, because of brain changing the way athlete perceives things. Due to head injury, brain chemicals are not being released in the same way, causing mood and emotional changes. In some severe cases, complete change in athletes personality may occur. Fourth and last category for concussion symptoms have to do with the athletes sleeping pattern. This symptom is recognized by looking back on the sleeping patterns, and seeing if there is a difference in how athlete sleeps after head injury occurs. SLEEPING MORE THAN USUAL OR LESS THAN USUAL. HAVING A HARD TIME FALLING ASLEEP even though athlete feels tired. Athletes sleeping pattern may dramatically change in case of a head concussion. In any case, if there is a chance that a head concussion has occurred, it is best to consult a Doctor for full extent of the injury and peace of mind. Brain injury should not be taken lightly. Brain is the most important organ in our body, and if there is a slightest chance that brain concussion may have occurred, SEE A DOCTOR.